Looking for something to do on the weekend? Here are a few suggestions to get you started!! The Noosa Junction Twilight Markets are every third Friday of the month. Join the fun for a night of street food, artisan stalls and live music. There’s also a pop up bar with happy hour prices all night. The Noosa Junction Twilight Markets are held from 5pm to 9pm in Arcadia Street, Noosa Junction. Nestled on the doorstep of the famous tourist town of Noosa, this popular park features some of South East Queensland’s most picturesque scenery. Discover secluded beaches, rugged coastal features and views from the iconic headland at Noosa Heads. Spot dolphins frolicking in the ocean at Boiling Pot and Dolphin Point, and be thrilled as thunderous waves crash into the rocks below Hell’s Gates. Wind through lush rainforest, fragrant open woodlands and heathlands exploring 15 kilometres of walking tracks. Walk along clifftops boasting unforgettable coastal views before leaving your footprints on pristine sandy beaches. The Sunshine Plaza is the biggest shopping centre on the Sunshine Coast. Why not spend the day exploring the shopping centre, watch a movie at Events Cinema or have lunch at any of the wonderful restaurants along the Maroochydore River. Nestled amongst the fragrant gum trees, every Sunday a hive of activity takes place. The Noosa Farmers Market is packed with locally-produced seasonal produce that will make your mouth water. Come along for the spectacular fresh food and produce and experience the Noosa Farmers Market for yourself. After your leisurely Sunday breakfast or before a long Sunday lunch at Noosa Marina, take a stroll through our Sunday markets. The Noosa Marina markets operate every Sunday from 8am to 2pm. Our art, craft and local produce market has an idyllic setting on the deck and overlooking the Noosa River, located just seven kilometres from Hastings Street. Take your time strolling around the many market stalls, where a variety of locally made craft items can be found along with the freshest of local produce. Click here to see the Sunday Markets map The atmosphere is alive with music and entertainment from local and interstate musicians. When it’s time to go home, let the Noosa Ferry take you on a relaxing ride from the markets to one of the stops along the river. New stallholders are welcome throughout the year, and most of our stalls are protected from the elements, providing the perfect year-round selling venue. We have one of the best beaches in the world right on our door step!!! If you are looking for something to do on the weekend why not spend the day at Noosa Main Beach! You can take a picnic, go for a swim, have lunch at one of the famous restaurant along Hastings Street or just sun bake! Don’f forget to take a towel, your sunscreen and your camera. If you take any photos hashtag #lexisnoosa so we can have a look! A Big Thank You from Fiji! Do you remember the bakesale fundraiser that Caroline from Student Uni Travel organised together with teachers from Lexis Noosa? The Australian dollars raised translated into $1000 Fijian and were used to purchase hardware and school supplies for families who were hard hit by the recent cyclone. Would you like to win a $1000 Backpackers World Travel voucher to explore Australia? Enter our school-wide video competition and be in the running to win this amazing prize! Videos should be under 2 minutes & feature your studying experience at Lexis –school, classmates, fun times and location. The finalists will be uploaded onto Lexis’ YouTube channel & the most likes win! The winner will be announced on 1 April 2016. Lunchtime is a busy time for Carol and her colleagues at Backpackers World Travel. Having a travel agency on site means that our students can book their weekend excursions and end of course travel without missing that early morning surf or afternoon swim. BWT are experts at finding the right package and will always discount for Lexis English students without compromising quality. No wonder it is all smiles. 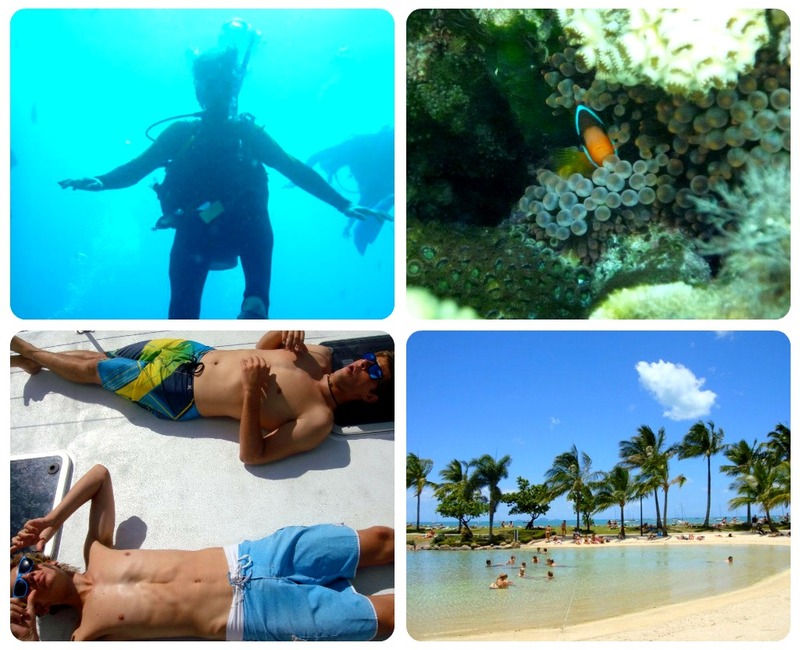 Whitsundays Sailing adventure: a great experience! Today the students came together for trivia at Student Uni Travel. The girls at the travel shop provided delicious snacks including Aussie Lamingtons (YUM my favourite!). The Students were quizzed on Australian states and cities. Overall, 10 students achieved 100%! The 10 students went into a draw where the names were pulled out for 1st, 2nd 3rd and 4th place. 1st Prize- a free trip to Fraser Island worth $350.00- Andrea!!! 2nd Prize- a free night in Cairns- Caroline! 3rd place- a free night in Airlie Beach- Elia! 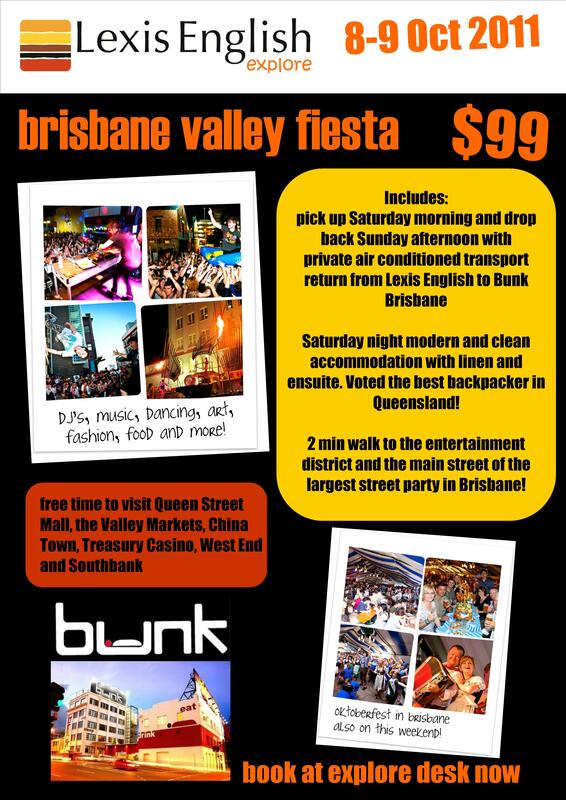 4th Place- $25 Student Uni Travel- Bianca! All students who participated received a buy one get one free drink for KB’s tonight! Great job Carol and Inika, it was a fantastic afternoon! 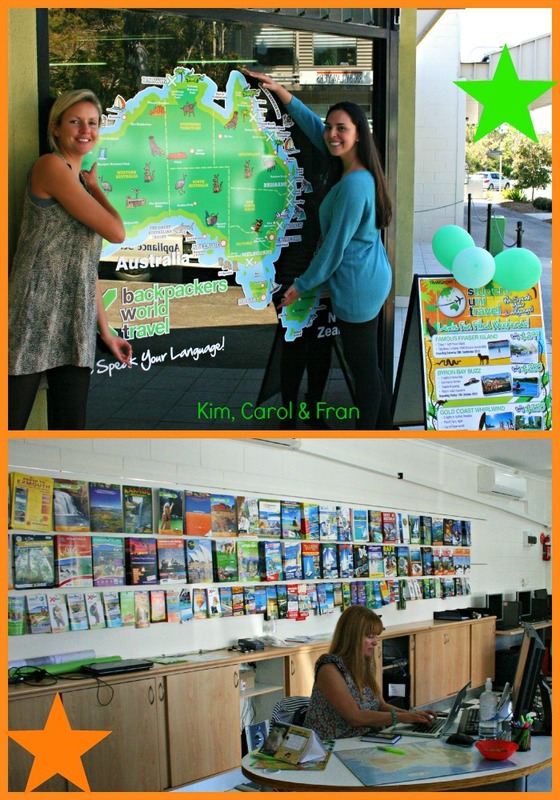 Pictured (top to bottom): Kim, Carol and Fran at the Backpackers World Travel office – Lexis Noosa. Fraser Island – here we come! Fraser Island 2 Day Adventure – 14th July 2012! 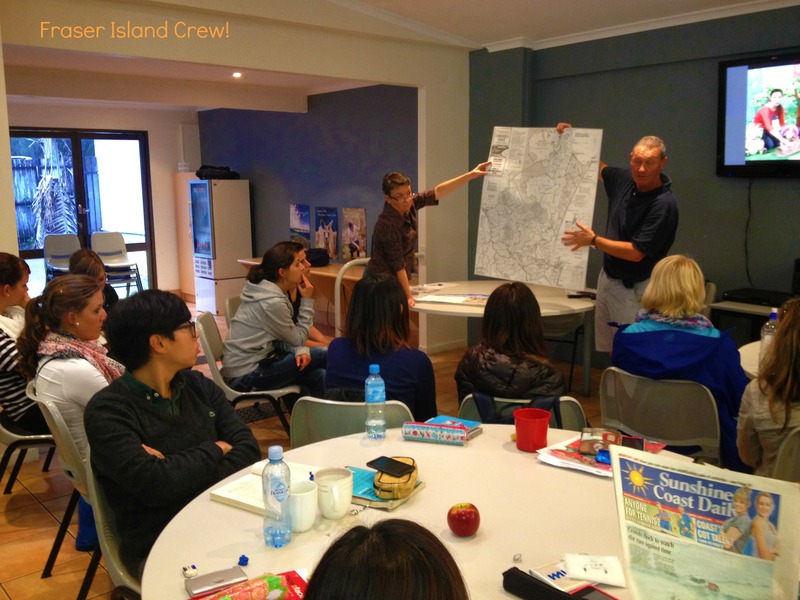 A Fraser Island information session was held today at Lexis Noosa for students going to Fraser Island (lucky them)! 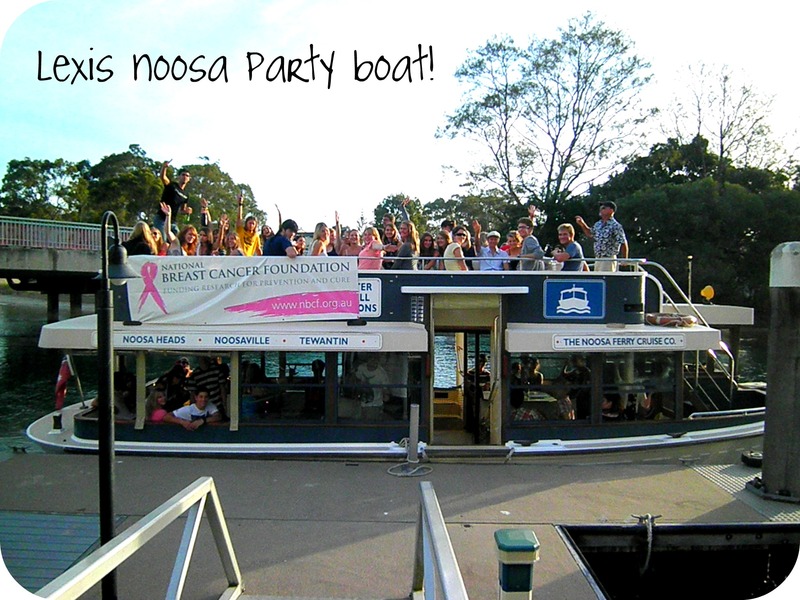 Lexis Noosa Sunset Cruise Next Monday! See Cindy or Cath and Jess at reception to book! Limited tickets available! 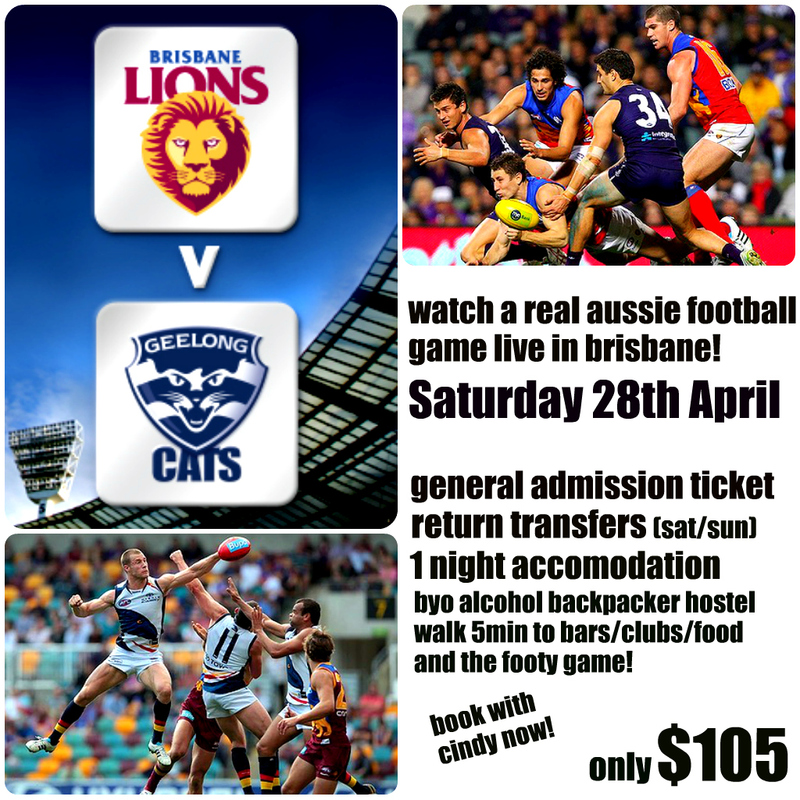 Your Chance To Watch A Live Australian Football Game In Brisbane! What Did You Do On The Easter Holidays Competition! I hope you all had a great Easter break! So what fun and adventure did you get up to? We want to see pictures! and WIN FREE surf lessons, accommodation in Surfers Paradise, colesmyer vouchers and much more! Lexis Noosa has been running locals tours for the new students this week to assist them in settling in and getting familiar with the area. 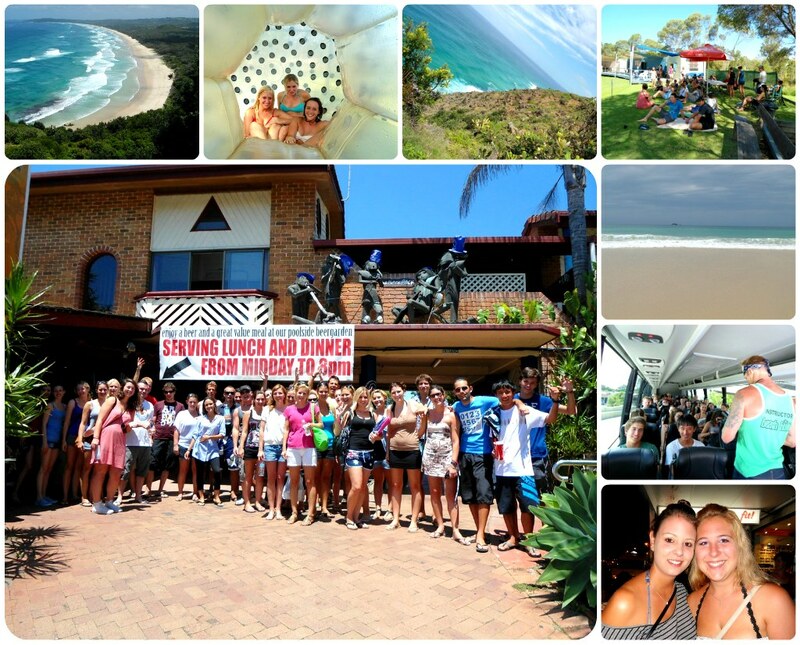 Students were taken to all the popular destinations and the secret spots that make Noosa the paradise it is. They visited Tewantin to see some wild kangaroos, Noosa River, the shopping spots, Hastings Street, Noosa Groyne, Noosa Lookout, Noosa Waters, Sunshine Beach and many more! Now they know all the places to go which will keep them very busy after school and on weekends. Enjoy exploring our awesome resort town! Congratulations to the FB photo competition winner Rebecca Rime from Lexis English Brisbane who won $500 worth of travel around Australia! And thanks to all the students who entered the competition. Looking back at all the photos posted it shows how positive and fulfilling the Lexis experience in Australia really is. 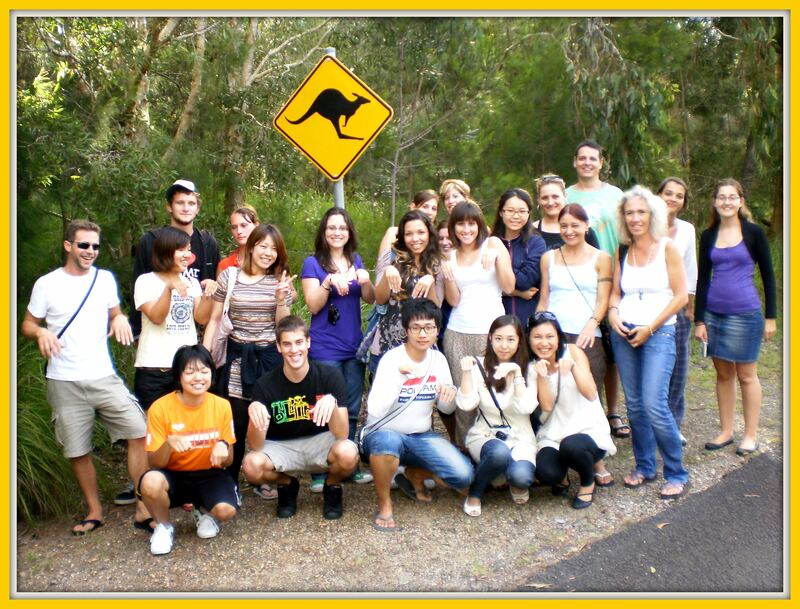 If you are thinking of coming to study English here in Australia, click here to check out the pictures and don’t forget to ‘like’ us! Congratulations to Lexis Noosa students Paula and Clement who are in the Lexis English photo competition national finals! Please Click here and ‘like’ their pictures by this Friday so they can win $500 worth of travel around Australia! Go Noosa! 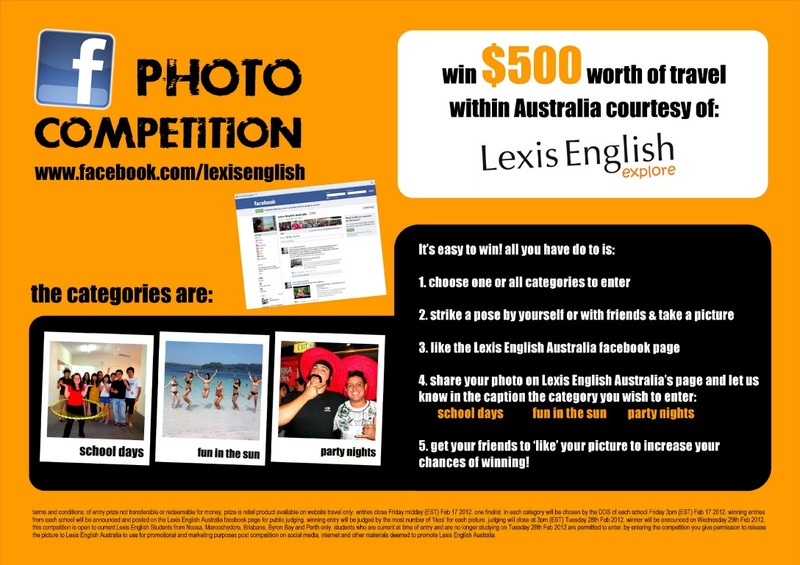 Lexis Photo Competition Entries Close Friday Midday! Great effort Lexis English students! All the photos look amazing! We can’t wait to see who the finalists are! You better show some love to the Lexis Academic Staff on Friday afternoon… they are choosing the finalists from each school! Here are a few entries from Lexis Noosa students. It’s not too late to enter click here and upload your photo for a chance to win $500 worth of travel! 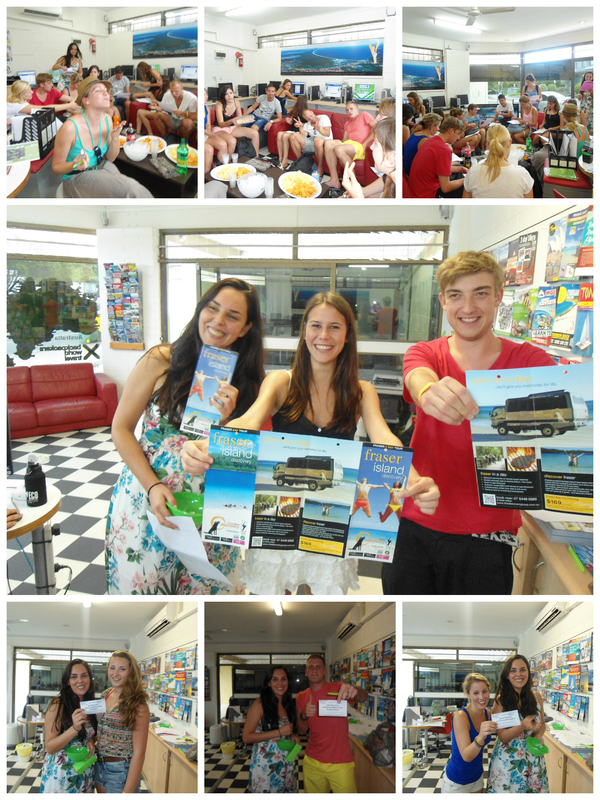 Lexis English students from Noosa, Sunshine Coast and Brisbane headed to Byron Bay for some relaxation… and partying! The weekend began with some drinks at Aquarius Backpackers beer garden before students hit the town till 4am. On Saturday some students relaxed on the beach, some hiked to the lighthouse and some went with Scott from Beach Bum to visit Nimbin, rainforests, waterfalls and the candle factory. Saturday night was party night again till 4am then recovery Sunday with a quick shopping trip to a surf factory outlet and a zorb ride in-between. Sounds like a great little weekend! Want To Win $500 Worth Of Travel Around Australia? Enter Our Photo Competition! It’s easy to win! 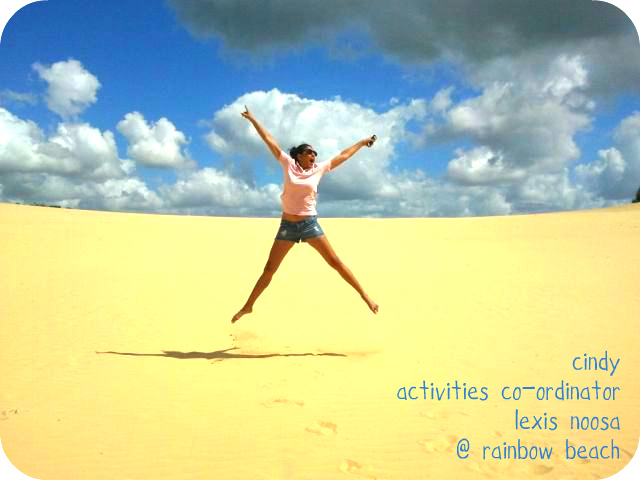 All you have to do is ‘Like’ the Lexis English Australia Facebook page and post a picture of your time in Australia! There are three categories to enter and you can enter as many times as you like! Not Sure What To Do For Your First Australian Christmas? 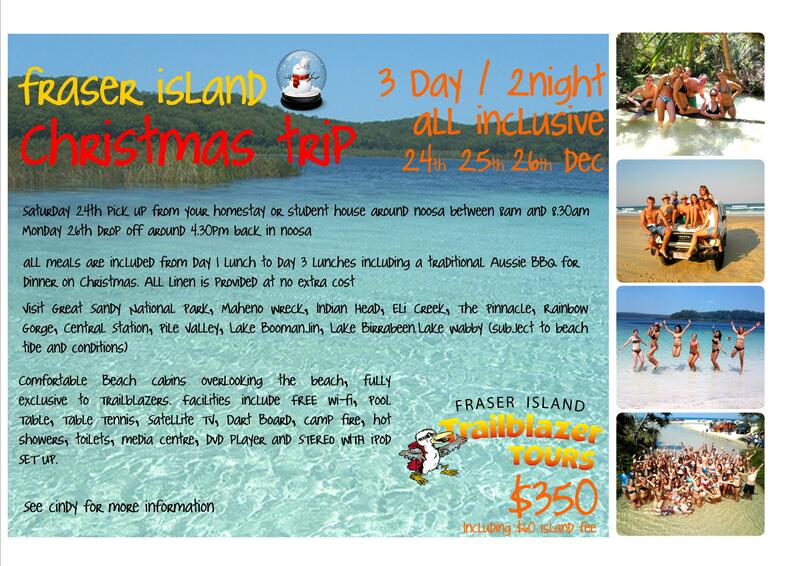 Celebrate Christmas on Fraser Island! Click on the picture for full details and see Cindy to book before 5pm on Friday! Not only do students learn to study english in a paradise environment at Lexis Noosa, they get access to some of the best destinations in the world to enjoy their weekends. 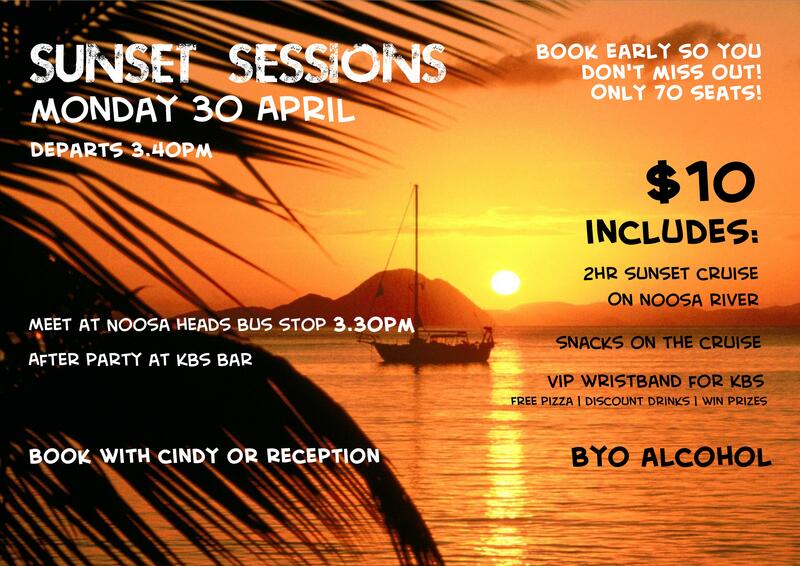 Lexis Noosa had it’s first Sunset Sessions! It was a great success and the weather was amazing! 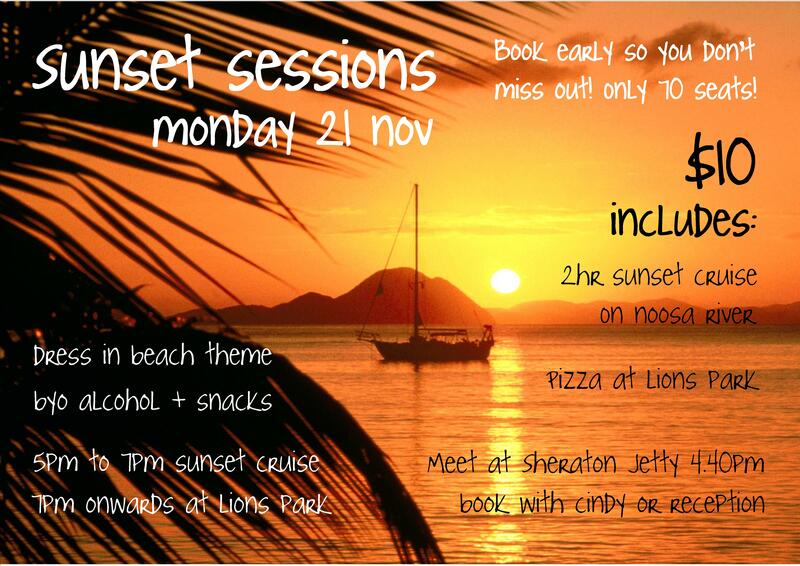 The next session is Monday 21st November with a beach party theme. Book at reception before tickets are sold out! Click here to see all the party pictures! Wow! What an amazing weekend! It was full of action, activity and adventure! Click here for all the pics of the weekend… and don’t forget to tag yourself! Lexis Noosa Fraser Island Weekend! It was certainly a weekend of fun and adventure on Fraser Island! If you didn’t go to Fraser Island last weekend, then you will be regretting it after seeing the gorgeous pictures… but not to worry as we have a lot more Lexis Explore weekend trips coming up including Gold Coast, Byron Bay, Great Barrier Reef and more! 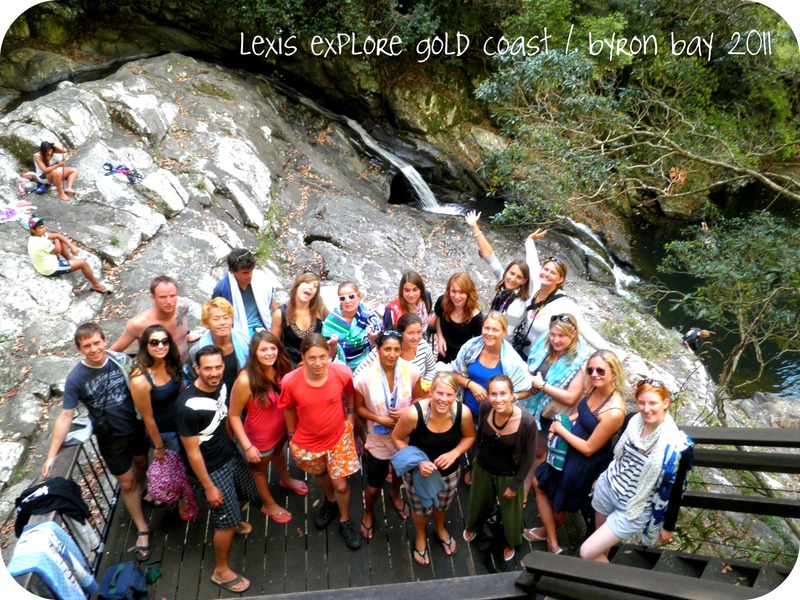 Click here to see the pictures of our Lexis Explore Fraser Island Weekend 2011! See Cindy at the Explore desk to book or sign up on the noticeboard today! It’s going to be a fiesta of a weekend! Free surf lesson with every Whitsunday’s booking this week! 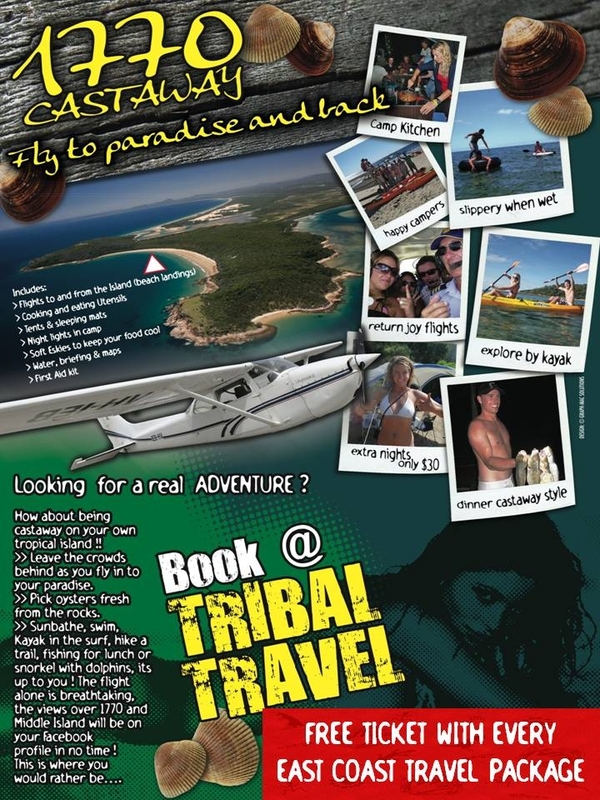 Tribal Travel has gone crazy and are giving away a free surf lesson in Noosa with every Whitsunday sailing bookings. Merricks’s Learn To Surf is one of the world’s best surf schools and are based in Noosa. Located on the famous Noosa main beach where the water is warm and waist deep, Learn To Surf offers safe, professional and fun surf lessons. Trained instructors use new technology soft surf boards and teaching techniques, providing you with your best ever chance to stand-up on the board. Make sure someone has a camera ready when you catch your very first wave! The Whitsundays are one of Australia’s most beautiful region’s, located here in beautiful Queensland… this is the place where you can go diving, partying, sailing, snorkeling, sunbathing, island hoping.. and much more!! Ask Kayley and Taisa anything about the many boats and trips Tribal Travel can book for you! Thinking of visiting Fraser Island? Go and see the girls at Tribal Travel BEFORE 6PM TOMORROW, 31/03/11, to save yourself $30 on the 3 day Fraser Island tour, or $20 on the 2 day tour. From the 1st April the prices of Fraser Island are going to increase so book in March to save some money. You can travel in April, May, June or make your ticket open dated and valid for up to 12 months! Fraser Island is one of the most beautiful places in Australia, with its spectacular coast line and magnificent Lakes, it’s a must to see when you are living in Noosa! Travel Competition This Monday! Win Prizes! 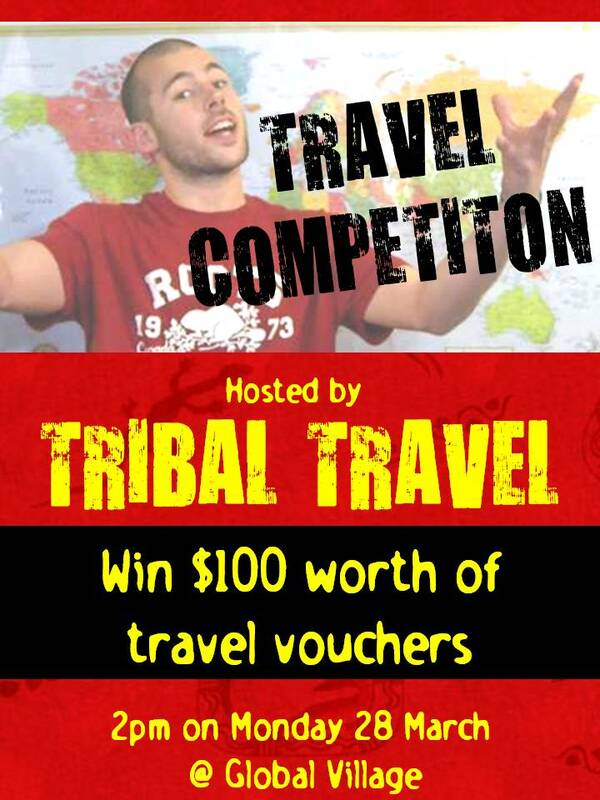 Tribal Travel will be hosting a Travel competition at school next Monday 28th March at 2pm. All you have to do is come along and answer some questions on travel around Australia, New Zealand and Fiji. Tribal Travel sell all of these tours, so they will bring along brochures for you to find the answers, plus I am sure you will receive a little bit of help from the Tribal Travel ladies, Kayley and Manu! Answer all the questions right to be in for a chance to win $100 voucher to spend on any tour, as well as 5 other great prizes including Underwater World and Australia Zoo tickers, plus much more! Tribal Travel is offering a free tour to all Global Village students … to watch the sunset at Mount Timbeerwah lookout. 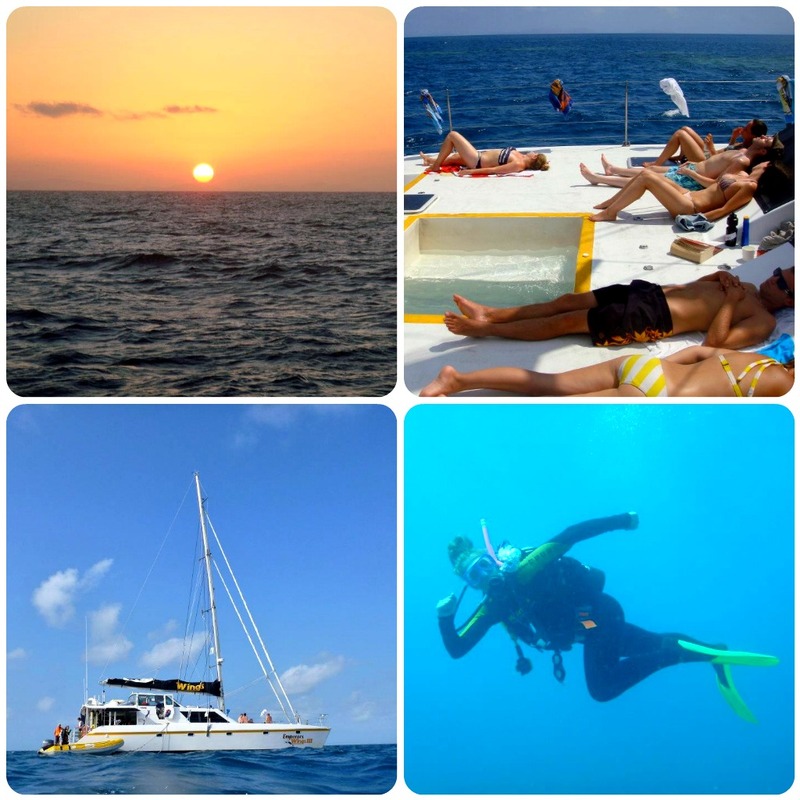 Come and join us on this fun Sunset Safari…. We will explore the Noosa Laguna Lookout as well as the amazing Mount Timbeerwah. If you would like to have a glass of wine or cold beer whilst watching the sunset, then feel free to bring your own. If you’d like to book on this free tour THIS THURSDAY, just head to the Tribal Travel shop to put your name down. Or speak to one of the lovely Tribal Travel girls when they come into the school. Please note: There is no guarantee of clear skies, but we will make sure that’s its a super fun trip! Have you every thought how amazing it would be to get away from everything for while? Well now you can, with one of the newest and best tours available on the East Coast. What better way to find yourself, have new experiences and make everyone at home jealous! The Castaway Island tour costs just $179 + $80 local fees. It includes 2 light aircraft flights and 1 night camping on Middle Island. Just $30 for extra nights. The departure is from the trendy, surf town of 1770, which in itself is worth a visit. 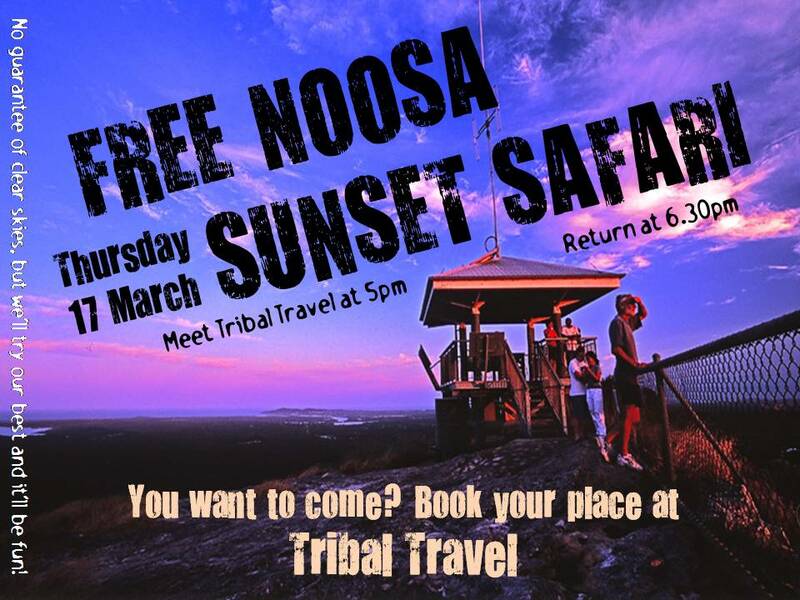 Tribal Travel in Noosa is issuing free tickets to all GV students who book an East Coast Australia package. The tour is exclusive to Tribal Travel, so speak to one of the Tribal girls if you’d like more information. 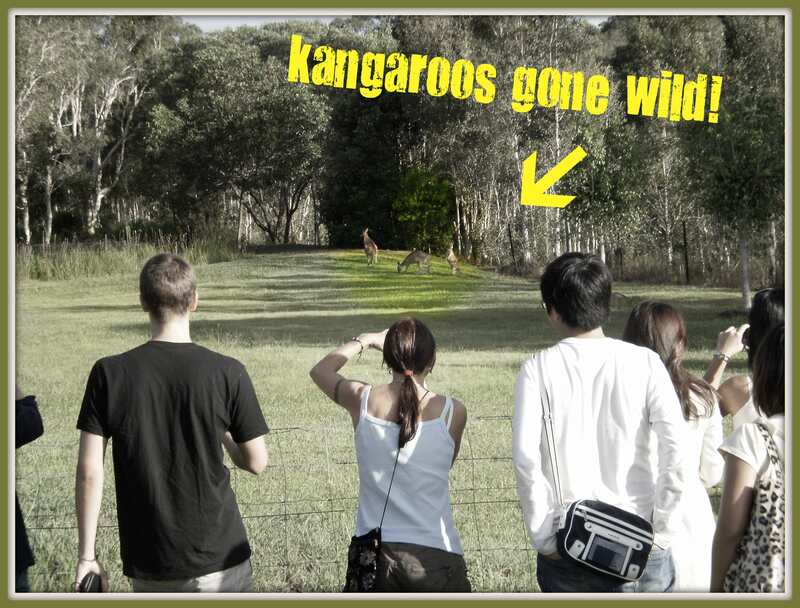 Tribal Travel took GV students for a free tour last Thursday looking for wild kangaroos. Armed with cameras and fingers crossed for luck, GV students set out to Noosa and surrounds with the legendary Bob from Tribal Travel searching for ‘wild’ kangaroos. It was Elanda Point that delivered the well awaited wild jumping marsupials and the cameras and students went wild too. Students were so excited that they celebrated by posing as kangaroos themselves!